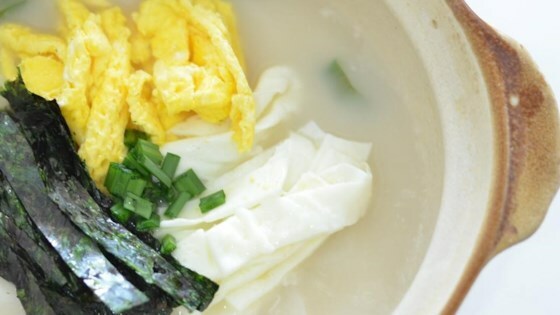 "This is a traditional dish enjoyed by many--if not all--Koreans during the New Year's and Lunar New Year holidays. Although there wasn't a lot of time for cooking or eating, I got to experience a semi-instant tteokguk for New Year's Day thanks to a good friend of mine. Garnish with green onions; add mandu (dumplings) or thin slices of beef if you like. Serve hot, as rice cakes will get soggy over time." Heat 1 1/2 teaspoon olive oil in a nonstick skillet over medium-low heat. Beat egg yolks in a small bowl and pour into the skillet. Tilt skillet so eggs yolks spread in a thin and even sheet. Cook until set, about 1 minute per side. Transfer to a cutting board and slice into thin strips. Repeat with egg whites. Place nori in another skillet over medium heat; toast until bright green and crispy, about 30 seconds per side. Cut into thin strips. Rinse rice cakes in cold water; drain. Pour beef stock into a large pot; bring to a boil. Add rice cakes and garlic. Simmer until rice cake slices are tender, about 5 minutes. Add green onions; continue cooking until rice cakes start floating to the top, 3 to 5 minutes more. Season with salt and pepper. Ladle soup into serving bowls. Garnish with egg and nori strips. Cylinder-shaped glutinous rice cakes (garaetteok or garae-tteok) are available in Korean markets. If you're using frozen rice cakes, soak in water for 10 minutes before proceeding. This soup is not only for special occasions, but can be deliciously enjoyed all year round for large groups and festive events.